The Clothes Don't Make the Man. Copyright, 1886. by William C Dunn. Words by Calvin Rankin. Music by Richard G. Mann. Who basks not in her light. Don't shun him if he's poorly clad. 'The clothes don't make the man. At turn of fortune's wheel. 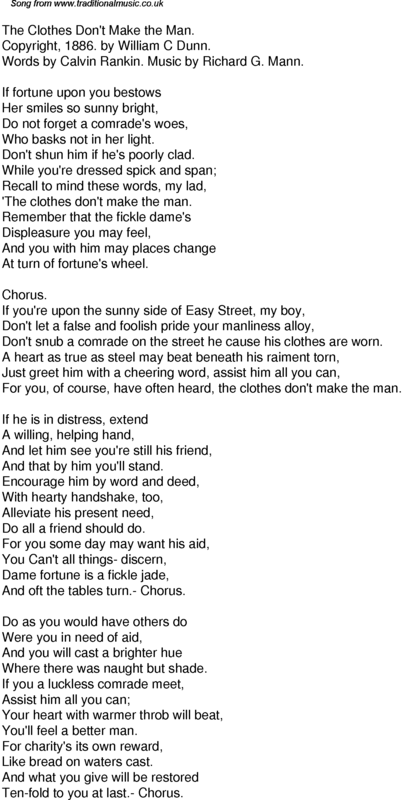 Don't snub a comrade on the street he cause his clothes are worn. For you, of course, have often heard, the clothes don't make the man. And that by him you'll stand. Do all a friend should do. And oft the tables turn.- Chorus. Where there was naught but shade. You'll feel a better man. Like bread on waters cast. Ten-fold to you at last.- Chorus.